A lighting struck the iconic statue of Christ the Redeemer in Rio de Janeiro during a storm in the night between Thursday and Friday last week. According to Brasilian authorities, the 38-meter sculpture was damaged during the accident which stroke witnesses for its impressive visual impact. 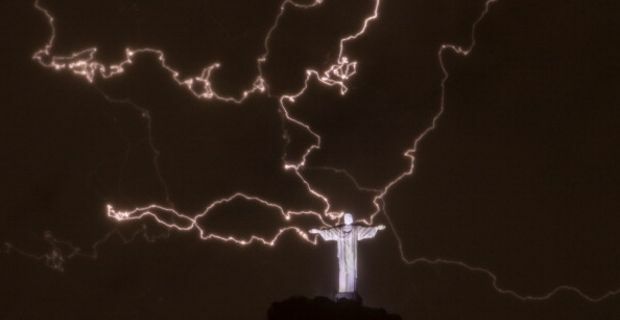 This is by no means the first time that the huge Christ figure dominating the city of Rio gets hit by lightning strikes. This time its right thumb was chipped away while its middle finger on the same hand was damaged during another storm just last month. What is for sure is that the reoccurring event, easily explainable by the material and position of the statue, as well as its sheer monumental size, is that every time it happens it looks like an amazing show put up by the combined creative forces of men and nature. Christ the Redeemer sits atop a steep Corcovado mountain overlooking the city. Made of reinforced concrete and more traditional soap-stone and built between 1922 and 1931, the massive sculpture is also known as the largest Arte Deco statue in the world. It was created as a symbol of Brazilian Christianity, but really Christ the Redeemer is also know as the true icon of Brazil. Its face and hand are the most exposed to the extreme weather conditions typical of its location, and in 2010 the statue underwent a $4 million renovation to repair those parts most affected by erosion. Father Omar Raposo of The Archdiocese of Rio told Globo Radio that repair of the fingers affected by the recent lightning strike will start soon. Luckly, the church still owns a stock of the same sop-stone originally used to build the Redeemer.